Add 50 or 70 More Ounces of Water to Your Pet Fountain. Increase the capacity of your Drinkwell Fountain. With these convenient reservoir add-on's, you can more than double the amount of water held in your fountain. Now it will last longer between fillings and make the unit more suitable for larger animals or multiple pet households. Choose from either the 50oz or 70 oz size depending upon your needs. This accessory is easy to install, and will greatly increase the value of your Drinkwell Fountain. Just pop it on and you are ready to go. Give your pets the fresh, clean water they deserve and do it even easier with an extra capacity reservoir. For use with Original Drinkwell Fountain. While most people are aware of the human benefits of drinking enough water each day, many likely overlook the intake needs of their pets. Water is an essential element for both humans and pets alike, yet getting enough H2O can be challenging especially for our furry friends that prefer free-falling water to stagnant water in a traditional feeding bowl. As a caring pet owner, there is a solution to better ensure the proper hydration of your pet - it’s Drinkwell The Original Pet Fountain. The Drinkwell Fountain is designed, approved, and recommended by veterinarians, particularly for pets prone to urinary tract disorders. This fountain will save trips to the vet by giving your pet this innovative constant access to running water. Add one of these convenient reservoirs to your Drinkwell Fountain and you will love it even more. Increased capacity means that it will be great for larger animals, multiple pets, or for greater piece of mind when you are away from home. Drinkwell Fountains should be cleaned regularly to keep the fountain running smoothly and to ensure your pet has the freshest water possible. Order Yours Today! Dimensions aprox. 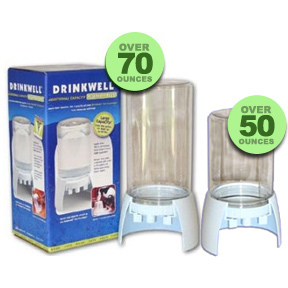 5.5" x 4.5" x 9"
Drinkwell Extra Capacity Reservoirs - Increase the capacity of your Drinkwell Pet Fountain. Choose either the 50 or 70 ounce size. These are great for people with multiple pets or just to have the convenience of waiting longer between fill-ups. Order Yours Today! Super Sticky Rollers That Are Totally Reusable. A De-Shedding Tool and Rake Brush Combined. A Super Absorbent Towel For Drying Dogs & Cats. A Large Automatic Watering System for Your Pet. A 2-Pack of Seed Pods for Your Drinkwell Aqua Garden. A Microfiber Mitten For Cleaning Your Pet's Paws and Other Parts.